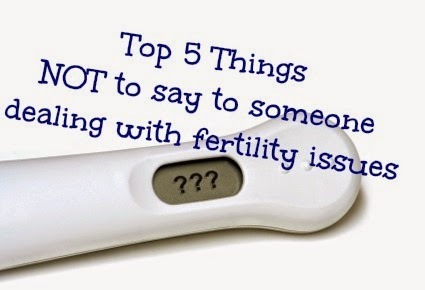 Dealing with infertility is a very sensitive issue. Your emotions can range from feeling like a failure, to worrying about the future, disappointment, to being optimistic, to feeling hopeless. When you have a friend who is fertility challenged, on any given day, they could be worried about money and bills, or they could even be in the process of a fertility treatment, emotions and hormones are running high. I know people are just trying to be helpful and reassuring. I know the people around me are supportive and rooting for a positive outcome. I know that everyone has a plan and that plan may or may not include children. What NOT to Say #1: "You can always do IVF." IVF (in vitro fertilization) is often seen as a cure-all for any infertility woe. Can't get pregnant? Just do IVF! Unfortunately it's not so simple. IVF is a very expensive treatment, rarely or partially covered by insurance. One treatment cycle can cost anywhere between $12,000 and $25,000. Multiple cycles may be needed to achieve success. One study found that the average cost of IVF treatment per successful birth is $61,377 (or $72,642 for IVF with donor eggs), the higher cost reflecting the need to do more cycles until pregnancy was achieved. IVF is not a cure-all. Even if you have the cash, IVF may not be successful. For women under 35, there's just a 39.6% per cycle success rate, and that will vary depending on the cause of infertility. The IVF success rate for women age 42 to 43 is a low 11.5% per cycle. Some couples may also need donor eggs, sperm, or embryos, or even a surrogate, which is significantly more expensive. Not everyone wants to go through the IVF treatment process. It's an invasive and emotionally intense treatment. While IVF is generally considered safe, it's not without risks. Some have religious objections to IVF. IVF is not for everyone. What NOT to Say #2: "Just adopt!" Adoption can be a wonderful option for some couples, but it is not a decision that should be made lightly. Suggesting adoption in a flippant way ignores the financial and emotional costs of adoption. Adoption doesn't take away the pain of being unable to have a biological child, so offering the option as a comfort doesn't usually go well. Adoption doesn't replace having biological children, but is instead another way to build a family. What NOT to Say #3: "You need to relax. All that stress is causing your infertility." This myth is so common that even some doctors repeat it, but everyday stress does not cause infertility. A large study published in BMJ that looked at 3,000 women, from 10 different countries, found that high levels of emotional distress before a treatment cycle did not negatively affect the outcome. In other words, feeling stressed out doesn't prevent your infertile friend from getting pregnant. You may also want to consider what came first - the stress or the infertility. Your infertile friend probably wasn't stressed out about getting pregnant until she discovered it wasn't happening the way it should. What NOT to Say #4: “If it’s meant to be, it’ll happen!" I know this seems like a reassuring thing to say, but unfortunately it isn't. One problem with this is it makes it sound inevitable that things will work out in the end. The truth is they may not. Being told, "Don't worry, it'll happen," tends to be translated internally as, "Stop complaining because it's not a big deal anyway." The other problem with this statement is it implies "giving up" isn't an option. But deciding to stop treatment, or even deciding not to pursue treatments at all, is sometimes exactly what a couple needs to do. Thank you, Captain Sensitivity, and Master of the Obvious. People know how old they are. There is no group more aware of their age than women of advanced maternal age who are trying to conceive in the face of infertility. Whether your friend is 25 or 45 or 105, calling attention to her age is not going to give any reassurance. You can say that you’re here as a support. You can say “This must be exceptionally difficult”, “Let me know how I can help”;” I am always here to talk”. If your friend should take you up on this offer, what you say will be far less important than how you say it. The most important thing will not be what you said or even how you spoke, but that for all the challenges and the potential awkwardness, you took the time to speak, and you really listened.